Alice: I work in the ophthalmic genetics field. Back in 2012, I was hugely intrigued by Eric Wieben and colleagues’ discovery that Fuchs endothelial dystrophy (FECD) was associated with a non-coding triplet repeat expansion within an intron of TCF4. I have always been fascinated by repeat expansion-mediated diseases and their respective pathophysiology. I also similarly have a longstanding interest in non-coding mutations and their contribution to human disease. The discovery that this non-coding repeat expansion was associated with a corneal endothelial disease, a group of conditions I had already begun to research with my mentor Alison Hardcastle and clinical collaborator Steve Tuft, gave me the impetus I needed to begin to develop my own independent research program. In 2015, I was awarded a Fight for Sight fellowship to work on the genetics of primary corneal endothelial disease and decided to initially focus my effort on developing endothelial cell culture methods to study the pathophysiology of TCF4 triplet expansion-mediated FECDs. Alison, Steve, and I subsequently partnered with Pete Adamson at ProQR therapeutics to explore the therapeutic potential of antisense oligonucleotides (ASO) therapy to treat this repeat expansion-induced pathology. Alice: I find the translational potential of this project hugely exciting. FECD is a common, age-related disease. The non-coding TCF4 repeat expansion is now recognized as by far the most common genetic cause of the disease in a wide range of ethnically diverse populations. Invasive corneal transplantation surgery is the currently the only treatment option available to restore vision and prevent blindness for FECD patients. This treatment relies upon specialist facilities, can be associated with operative complications, and is dependent on the availability of healthy donor material, of which there is currently a global shortage. These issues, in addition to the global aging population, highlight the need for alternative and effective treatment strategies to be developed for FECD. Our paper highlights the potential of an ASO mediated therapy to treat this common, sight-threatening disease. Alice: Our study has impact beyond the ophthalmic research field, given that a wide range of neurological and neuromuscular diseases are caused by similar repeat expansion mutations, such as Huntington disease, myotonic dystrophy, and amyotrophic lateral sclerosis/frontotemporal dementia. Using our patient-derived corneal endothelial cell model has enabled us to study the cellular consequences of the repeat expansion within its native genomic and cellular context. The cornea is an easily accessible tissue that can be readily monitored for pathological and sub-symptomatic signs, unlike many of the neuronal tissues affected by other repeat-mediated diseases. We hope that any future therapeutic advances regarding TCF4 repeat expansion-mediated FECD and using the eye as a model system could be adopted for other, less tractable, non-coding repeat expansion mediated disease. Alice: Don’t be scared to just give things a try. Often, as scientists, we can feel overwhelmed by the enormity of what we are trying to achieve and it is easy to focus on the problems and limitations associated with our experiments. Overcoming our personal fears of failure and giving ‘the impossible’ a try can often lead to unexpected and rewarding outcomes. I believe that the saying ‘it is always better to have tried and failed than to have never tried at all’ is very applicable to science. Alice: I gave birth to my first child in October 2016 and since then my life has been a real juggling act between work and family. At the moment nothing makes me happier than spending quality time with my little boy and husband outside of work. I love to do bikram (hot) yoga to help me relax and generally lift my spirits, especially on dark, cold winter days – which are plentiful, living in London! Alice Davidson, PhD, is a Senior Research Associate at the Institute of Ophthalmology at University College of London. 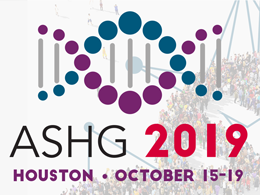 She has been an ASHG member since 2018.